My grandma taught me to never order a steak at an Italian restaurant. "They don't know how to cook it," she'd say. It took me some thirty years to realize that Grandma may have been wrong, or, I just picked the right place to break her rule. If an Italian restaurant in NJ were going to get steak right, I figured Grissini in Englewood Cliffs had pretty good odds. Growing up in Bergen County, Grissini’s high gloss image was validated by the regular stable of gleaming, valet-parked chrome grills out front. Grissini is very Jersey, specifically, very north Jersey. Known for goodfellas and sport jackets, it was Italian, it was proud, and, more than anything, it was known for being very expensive. Even as a nineteen-year-old foodie, I was too intimidated to call for reservations, never mind attempting a walk-in. Fuhgetaboudit! But, modern day food bloggers are treated well, and I was invited to a press dinner. To my delight, the atmosphere was much less intimidating that I had expected, but the cuisine was just as bombastic as I imagined. Grissini doesn't hold anything back. They hang it all out there - mushrooms, charcuterie, figs, and most especially, their white, Italian truffles. Our meal started with the presentation of a large bowl of white truffles, nested in Arborio rice. I don’t know if security tags were implanted inside these prized nuggets, but, hey, who would steal from these guys anyway? The bowl went around the table and returned safely to the manager. Cocktails and wine followed, including the seasonal truffle martini, complete with shaved white truffles floating atop. But, wait, why would anyone do that to a truffle or to a martini? Because it sells for $130 a pop! You read right, a triple-digit martini! And what does it taste like? Well, I've never tasted anything quite like it…needless to say, I’ll stick to the wine list. Keeping with the indulgent theme, I skipped the salads and pasta, and began with a lobster salad ($22) that featured a half of poached Maine Lobster with asparagus, avocado, grape fruit potatoes in a black truffle vinaigrette. It was delicate in texture, and strong on flavor and fragrance. Delicious. I was ready for more, and that’s when I broke Grandma’s rule. Admittedly, I was feeling a bit feisty that evening (maybe it had something to do with the highway traffic getting there) and I was craving meat. I bypassed the usual suspects - Marsala, Piccata, Milanese, Francese and the like - and went for the Bistecca Ai Ferri ($42), a grilled 16 oz. sirloin steak. I’m always pleasantly surprised when I get a steak cooked to my desired specs: extra rare, black and blue, cool center, and Grissini nailed it. I was amazed and it was superb. Mr. Hot ordered the special double veal chop that was so thick it was served vertically because it was wide enough to stand on end. 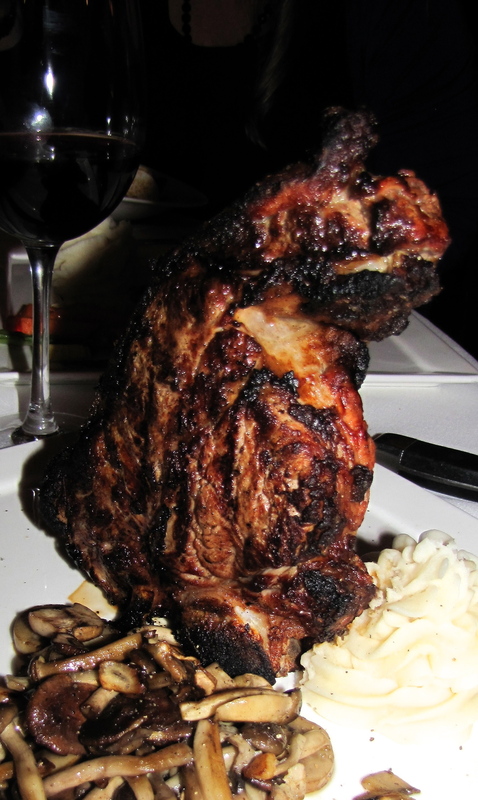 Almost enough for two to share, the chop was succulent and delectable down to the bone! Other courses around the table, including the fish, didn’t seem to thrill the same way the meat did. In sum: leave the fish, take the meat and stick to the wine list!